It’s been way to0 long since I’ve shared a “bowl” recipe with you all, but this is my favorite way to serve dinner! (You can browse my other bowl recipes here). You’ve got your grains, veggies, protein and a healthy sauce all wrapped together in a delicious dinner. 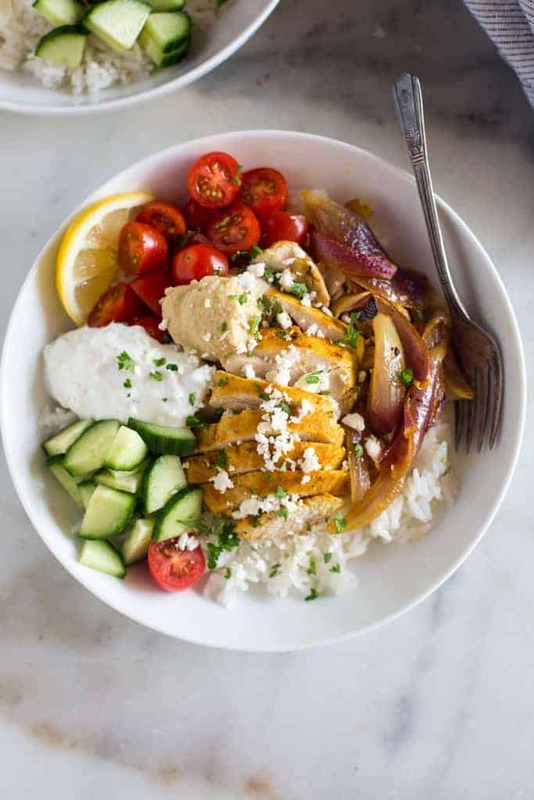 Most of the elements of these Chicken Shawarma bowls can be prepared ahead of time, including marinating the chicken shawarma, chopping the vegetables and making the sauce, so that dinner is a breeze! This middle eastern inspired Chicken Shawarma recipe is easy to make from home, it’s healthy and packed with awesome flavor. Shawarma is a way of preparing meat in middle eastern culture where meat is roasted (typically on a revolving spit) and then cut into thin slices. It’s similar to gyros (or doner kebabs) but the preparation, marinade and type of meat can vary. Meat used in shawarma recipes is typically lamb, chicken, or beef. I wish that I had a revolving spit to roast an entire chicken, but for this recipe we’re using marinated chicken thighs and roasting them in the oven. It’s not completely authentic but it tastes amazing, and works for those of us wanting to imitate chicken shawarma made from home. Start by making the shawarma marinade which is a mixture of lemon juice, olive oil and spices. Marinate the chicken thighs for at least an hour. Next, cook jasmine rice according to package instructions. Then make the tzatziki sauce (directions follow). 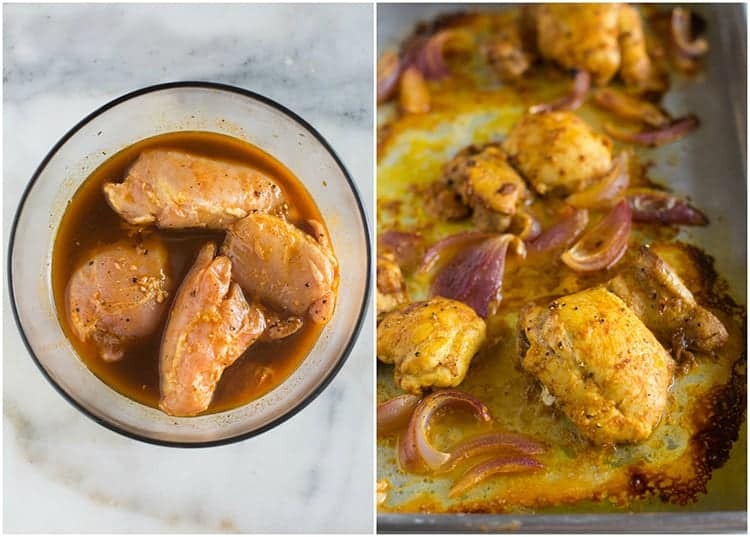 Place the marinated chicken along with some slices of red onion on a baking sheet and bake them for about 30 minutes, or until cooked through. Tzatziki sauce is really easy to make and adds a delicious creaminess and flavor as the main sauce for your chicken shawarma dinner. To make tzatziki, peel and dice a small peice of english cucumber. Add it to a bowl with plain greek yogurt, a squeeze of fresh lemon juice, garlic and chopped dill. Stir the sauce together and season with salt and pepper. Tzatziki sauce can be made one day in advance. Now you’re ready to assemble the chicken shawarma bowls! 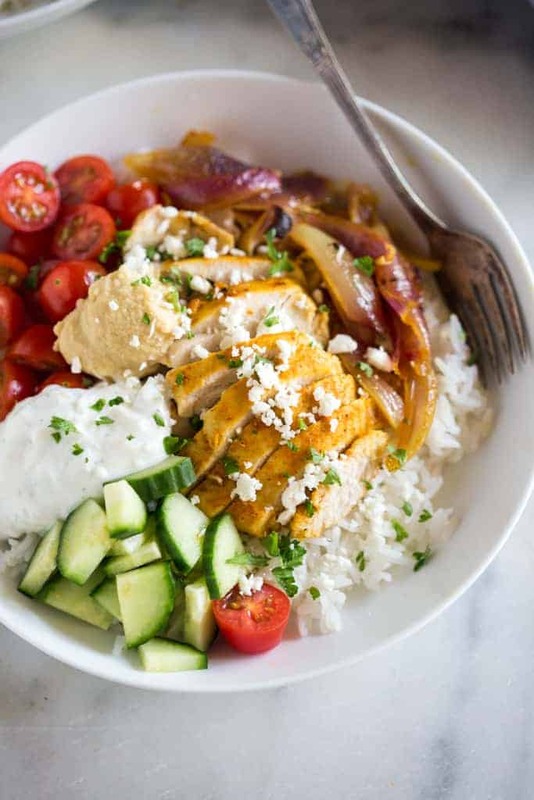 Add a spoonful of rice to your bowl, top it with chicken and onions, add some tomatoes and cucumber, a dollop of tzatziki sauce and hummus and finish it off with some chopped parsley and feta cheese. Dig in! 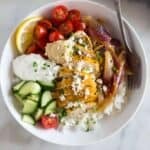 This middle eastern inspired Chicken shawarma recipe is easy to make from home, it's healthy and packed with awesome flavor. Mix the shawarma marinade ingredients together and marinate the thighs for at least one hour or overnight. Cook the jasmine rice according to package instructions. 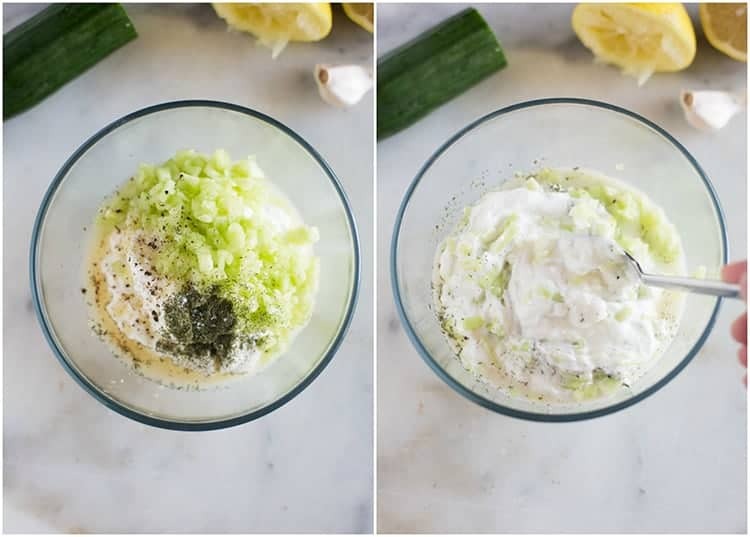 Make the tzatziki sauce by combining all the ingredients in a bowl. When ready to cook the chicken, preheat oven to 425 degrees F. Grease a baking pan, remove the chicken from the marinade and place the chicken thighs and chopped red onion on the pan. Bake for 30-40 minutes or until baked through. Allow the chicken to rest for a few minutes before slicing thinly. To serve, add a scoop of cooked rice to the bottom of your bowl. Top with chopped chicken and red onion, a few cucumbers and tomatoes, and a scoop of tzatziki sauce and hummus. Top with fresh chopped parsley, feta cheese, a little crushed red pepper, if desired. I have made so many of your recipes and never fail- they are so delicious! My kids and husband love them, too. I was nervous cooking with turmeric. I didn’t even have it in my spice rack. I am so glad I did. This is so AMAZING! The marinade is also delicious when used on chicken breasts on the grill. Thank you for sharing your knowledge and love for food/cooking. What a wonderful compliment– thank you so much Nicole! <3 I'm really happy you enjoyed these bowls, and even happier that you've tried so many of my recipes. Thanks for your kind comment. This is so delicious. Thank you so much for this amazing recipe. I am looking forward to try some of your other recipes. Omg. Delicious!! My kids loved this too! The measurements for marinade were perfect! I marinated and cooked in my air fryer on °400 for 10 min and I used breast (cause that’s all I had). I am definitely saving this recipe!! Restaurant quality!! Thanks so much! The air fryer is a great idea- I may need to try that soon! Do you serve this cold or hot? I warm the pita and the chicken is warm when I serve it–everything else is cold.